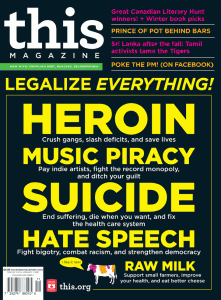 Cover of the November-December 2009 issue of This Magazine. Click to enlarge. Deserving of recognition for this fantastic achievement are: Lisa Whittington-Hill, our Publisher; David Donald, our art director; Stephen Trumper, our cover consultant/guru; Transcontinental/LGM, our printer; and Magazines Canada/Disticor, our distributors. Thanks also, of course, to the many talented contributors who made this such a special issue, the board of directors for making the whole enterprise viable, and thank you for buying into the idea of This Magazine—and, more to the point, buying a copy or subscribing. That’s why—while we believe it’s still super-important for This to be visible on newsstands, so that we can introduce ourselves to new readers who wouldn’t otherwise discover us—we encourage you to buy a subscription to the magazine. When you buy a single copy of This off the shelf, only a small fraction of that sticker price makes it back to us to support the magazine’s work (the store, the distributors, everyone who touches it on the way to and from the newsstand gets a cut). But when you subscribe, you’re directly supporting the magazine and its contributors, and subscription revenue is more stable and predictable, meaning that we can concentrate less on worrying about the bills and focus on making the best small magazine in Canada. OK, nagging over. We’re thrilled by this win and thank all of the wonderful people who made it a reality. Our thanks to the judges for recognizing This among the other strong contenders in the category, and congratulations to our fellow winners. See you on the newsstand!